She was an item of immense, untouchable beauty. Encrusted in dark African mahogany from the deepest plains of the Javanese rainforest, and carved by American Indian natives to resemble the history of a Mayan civilization, Le Coffre Au Trésor (The Treasure Chest), stood pride and place, deep in the centre of a Parisian museum. The most beautiful creature in France, Europe, and quite possibly, the entire planet. 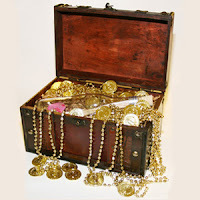 For years, many had mused over the chests immense beauty. They proclaimed her aesthetic powers were so dominant that – much like how the sailors of Odysseus drowned trying to swim to lands containing the irresistible echoes of the sirens song, many had taken their lives upon sight; trapped in the knowledge the box could never be theirs, and theirs alone. And yet, her deepest mystery was the beauty contained within. Because she was stunning on the outside, they assumed, she could only be even more so, once opened. Many men came and tried – time and time again, yet failed. They had become so afraid of the overwhelming nature of her outer shell, they were too scared its contents would destroy them – believing her internal energies more powerful than any man who ever lived. Some imagined her contents contained riches beyond their wildest dreams; such as gold bullion or pure white diamonds. Others pictured the Turin Shroud, the secret diaries of Napoleon Bonaparte, or even – for those truly enamoured by her enigmatic charm… a scripture, written by God himself. The beauty on the outside had drawn them in. There was however, one person, who knew all the answers to the questions - sought by the obsessed, the interested, and the insecure. Her name was Rienne; a retired Parisian con-artist. On returning to France thirty years previous, she found herself in need of financial stability, so, taking from a series of urban myths, created a story around a bland, useless old box found behind the back of a bric-a-brac store. She carved a few images upon it, used a tree from her local woods to add for effect, and painted its outer layer in black liqueur; then constructed an old lock, learned from her days dating a Houdini-esque magician. She built the legend on Chinese whispers, and developed its value on intrigue. The chest was a fake – a copy of a thousand other attempted copies of something which never even existed. The only difference was - in constructing her artistic fraud, she had done her homework. All the while, a similar, open chest of drawers sat around the corner in the same museum. She was a genuine piece of oak, just as beautiful, and once served great purpose housing the Crown Jewels of many wealthy, historical monorchies. Her internal casing now contained thousands of coins; thrown inside, to aid the wishes of visitors across the world. Her value was enormous, but, as she showed both her strengths and her frailties, was not held in such illusionary high regard, as the attention grabbing phoney next door.